2012 Mayor's Community Service - Equal Rights Amendment No Time Limit on Women's Equality! 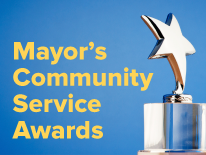 The Mayor's Community Service Awards (MCSAs) are an annual campaign to recognize extraordinary District residents who use service to make a significant positive contribution to the community. MCSA recipients were chosen in six categories, including Community Service, National Service, Emergency Preparedness and Public Safety, Education, Youth, and HIV/AIDS Advocacy. The mayor’s community service award went to Carolyn Cook, a native Washingtonian, American University graduate and Chevy Chase advisory neighborhood commissioner. A women’s rights advocate, Cook founded United for Equality LLC in 2010 to help ratify the Equal Rights Amendment so that the U.S. Constitution explicitly states that all women are entitled to the same inalienable rights as men. The deadline for ratification of the ERA expired in 1982, leaving women facing gender discrimination with insufficient protection under the law with which to fight their grievances, Cook said. She is also working with the nonprofit Cultural Tourism DC to establish a women’s history trail in the city. Cook was inspired to become an advisory neighborhood commissioner in 2009, after Hillary Clinton lost her bid to become president. “There is a dearth of women in political office, and during Hillary’s concession speech I decided to see what I could do to contribute to public office,” Cook said. As commissioner, one of Cook’s goals is to improve the quality of life for her community, from improving access to public parking for people with disabilities to installing bus shelters in Chevy Chase and advocating for senior citizens.